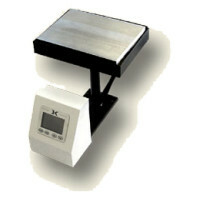 This 6"x8" bottom heat fixture is fit for Geo Knight DC16, DC16AP, DK8, & DK8T heat presses. The seperately controlled heat pedestal slides right into the position the standard table is located. Bottom heat fixtures are ideal for thick embroidered appliques, certain lettering transfers, and other heat transfer and fusing applications requiring top and/or bottom heat.